The Profile Previews we started beta testing two weeks ago are now live everywhere on WikiTree! You should see them anywhere you hover over a link to a name. For example, if you put your cursor over my name below you should see mine. To see your own, hover over the "Profile" link in the "My WikiTree" pull-down menu above. If you hover over your parents' names in your preview it should switch to theirs. You can navigate up and down from there, all within the preview window. These won't work on most mobile devices because phone and tablet browsers usually don't let you hover over links. If you touch a link you go the page. In Android you may be able to see the previews by touching and holding the link. These are privacy-controlled. If a profile is private what you see depends on whether you're on the Trusted List. I hope you like these as much as I do. In certain circumstances they could be a distraction (for example, we're considering whether to remove them from pull-down menus) but overall I think they constitute a major improvement to WikiTree. They could transform the way we browse trees and do things such as reviewing search results and potential matches. Please post here if you have questions, problems, or suggestions. We made a number of improvements based on suggestions from Rob Jacobson and others in the beta testing discussion and are likely to be making another round of improvements soon. I like the concept, but they do pop up at irritating regularity and obscure what I am trying to do. I love these new changes! I can see where sometimes the box maybe in the way, but overall it's awesome! I was going thru my profiles and checking to see if the security on the profile was accurate. I could place the cursor on the children and see if they were mine without going to them! Update: We just released a round of improvements, based mostly on the member feedback here. You can now turn off the previews, either temporarily or permanently. You will see links for turning them off within the preview windows themselves. If you turn them off permanently you can turn them on again in your settings. We tweaked the timing. They now open just a little bit more slowly when you hover-over them and close a little more quickly when you move your mouse away from them. They no longer appear in the pull-down menus. We've also added a couple bits of information. You can easily see when the profile is orphaned (instead of just not seeing a profile manager's name). And there is copy-and-paste code for creating a link to a profile, like this: [[Whitten-1|Chris Whitten]]. Thanks for the new improvements for the Profile Previews, Chris! THANKS ! ! ! for listening and making improvements. Thank you! Many nice changes to the previews. I will find them useful now rather than in the way! The recent improvements are a good solution. I am happy with the pop-up feature now. Kudos. Wow, that's great, temporary or permanent turn off. I love them so I'll not be turning them off permanently but temporary is useful especially during side by side merge comparisons. Another GREAT use for using the pop up panels is to grab the profile ID number. I like to include the ID numbers when I refer to the parents, siblings or other relatives and make the names stand out. This enhancement makes it so easy to obtain those numbers! These are very helpful, especially as inside the preview you can step back to the ancestor or forward to descendants. Saves quite sometime well done! I find this a major distraction when trying to edit profiles. Due to using an older slower computer this makes my editing much slower and causes me to stop sooner than I would. The problem is with my computer so there is nothing you could do as long as this is active to fix this but It could be a problem for others as well and adding this to other places will probably just make things worse. Not a theory. It works on mine. Must be your computer, then. That is the point of my answer. This does not work for everyone and for those for whom it is a problem there should be a way to disable it. From the comments on this answer and other answers that I have read there are enough members who would like this to be optional that it would be worth making it optional. I am not saying it should be removed, just give us the ability to turn it off if it is a distraction or a problem. Although I do love the addition I totally agree with Dale Byers, Walter Steesy, Kristina Adams and Chase Ashley that it is very distracting and annoying. When working on any list, like the surname lists, this huge blocks keep popping up if you just accidentally move the cursor over a name. Then you have to either click X or wait for the block to go away on its own. I think it would be a much better feature if you can either disable it or even if appears on the top right hand corner of the page where it does not prevent you from seeng the list that you are busy working on. The information that is provided is great but I only want to see it when I need it and not every time I hover over a name. I am sure that speeds vary by computer (maybe?) for the amount of time before the popup appears after you hoover your cursor over the name. What about a delay? On my computer, the pop up box comes up just under one second. What if the delay was 2 seconds? For those who want to see the pop up, they wait one second longer, I have no problem with that. For those who are scrolling and zoom past names, they won't be activated unless the cursor lands - and stays - on a name. SJ, There is no maybe, computer speeds do vary and the cheaper ones are slower. On my system the popup is activated the instant my cursor hits the name but even moving off and working on a different tab the popup still remains until I refresh the page. The problem is real and the solution should be easy, just make this feature optional. That way those who like it can keep it while those of us who have problems with it can turn it off. That way everyone wins. Dale is right, the moment my cursor hits any name on the list the popup appears. I do scroll a lot on surname lists and it is now very frustrating. I don't mind that it pops up so quickly it is just that it then blocks a big chunk on the screen directly on the spots that I am busy reading. I then either have to wait for it to go away, or move my cursor of the column where the profile names appear. If the block could be smaller and appear in the top right hand corner of the page out of the space that I am trying to look at, it would be a great help. I did not think they popped up randomly. It doesn't happen to me. It is does not pop up randomly, it happens the moment that you accidentally leave your cursor on a name. As you can see, if I was now looking the profile at the top of the list I can not see the full names or dates. The basic idea is OK but I would like to see it always appear on the right covering the instruction statements on DNA, collaboration, etc. and not over the database entries. To all, I recently was given a used computer that is newer and faster than my old one but the popups are still very distracting and slows down my work. I have no use for them and if given the option I will turn them off. This is a great addition to the WikiTree experience! Many thanks to those who made this happen! Big problem that I see is that you can easily go forward with hovering, but not backward, which was mentioned previously, so 10 deep on ancestors and you have to start 'clicking' the back arrow at the top, since it is not a hoverable link. It does work great to see the ancestors down a line. I am LOVING this feature in categories! I love all the wonderful additions Wikitree is adding! Keep them coming!!! Great to have this addition. Wasn't really sure if I was going to like the profile pop ups but on Ranger duty tonight, it is definitely cutting the work. For example, in looking at the merge feed and I see multiple merges from one person, a simple hoover over their name and if I see an Arborist badge, I don't even need to click on their profile. And when I see a lot of pre-1700 edits and the popup shows the person has two badges, a good indication to take a closer look. SJ, I would never have guessed you were so young!?! I try to keep out of the sun. I agree SJ, it is a lot of fun and much easier seeing who's who, instead of clicking on their name in g2g, then clicking their name again to get to profile. It would be hilarious if they put those mustache and glasses pic on those without a profile pic, ha! In total agreement with SJ. When I am looking at the Family group sheets, especially those with lots and lots of children, no need to click back and forth. And it is very cool on g2g posts. Thank ou Wikitree team. Edit: I have found this to be a boon when editing profiles to include links to others. Before, I had to click through profile links to get the WikiTree IDs. Now I can see not only the IDs of those I hover over, but also when I hover over parents in the pop-up. So, if I want to include something about grandparents, I no longer have to click through links and then reverse course to get back to the profile I'm editing. I can't see the Wikitree IDs when I hover over the preview which is the only disadvantage for me. Previously the WikiTree ID would appear by hovering over the person's link - useful when adding relatives to profiles but now I have to click on the profile. I love them! It will take a bit of getting use-to, but The print is larger (I am OLD!) and they carry a bit more info than the former! Yay! I'll add my cheers to the others. :-) I keep finding more ways that it's helpful. Most importantly, when doing a compare, the preview pop-up on the right side of the comparison screen is partially hidden by the left side of the comparison screen. This happens in both Chrome and Opera. The previews aren't available yet on the Family Group Sheet. Didn't know if this was by design. Again, an issue for both Chrome and Opera. Thank you, Chris, for your hard work and innovative thought. While this is an interesting addition, I think that I would much prefer a way to go from any profile to its local "tree," to be able to see where I am at the moment. Either the ancestors or descendants, I'don't care, but a way to go from individuals to trees and back more easily. Again, thank you for your time and energy. Thanks, Robin. I assume you are familiar with the Ancestors and Descendants buttons on profiles. Those were designed as an easy and fast way to see trees and descendant lists without leaving a profile. Also, I assume you have seen the tiny icons on Profile Previews and elsewhere to go to trees and descendants. Thank you, Chris. Yes, I use the ancestor/descedants buttons... guess I was thinking of pop-ups, and how one could look quickly at a popup to see the tree and how that might be more useful to me (given my memory) than the current iteration (which seems a bit distracting to me and sometimes obscures other info I'm interested in). Again, thank you for your hard work and the time, energy, and good intention in making this cite available to us. This is a nice feature. Thank you for your hard work Chris. It would be awesome if it could show instantly if we were related as a cousin match. I know it would have to calculate that and would probably not be possible while hovering over the profile name. This is nice just have a quick preview rather than just a profile name we have to click on to bring up the entire profile. Though I love the basic idea, I agree with Dale Byers in that it slows down editing of profiles. Can you explain more? In what ways does it slow down editing? P.S. In a later release, we may be able to add a setting to disable the previews for those who don't find them useful. I'm going to pop in here with a response, though I am not Dale. I find that it takes longer to populate and display the box than the former tool tip which showed birth data when hovering over a family member's link. Someone else mentioned that they liked it because it provided the Wiki ID. I could usually get that by hovering and looking at the bottom of the screen to see the URL. I didn't have a way to get grandparent's Wiki IDs but I use that so seldom that it isn't a time saver for me. I like it sometimes and other times would prefer to have the tool tips. Any chance that a toggle between the two styles would be an option? If not, I hope that you are able to implement turning the previews off and on, Chris. I like this way to display the Wiki ID because the font is larger and I don't have to squint at the bottom of the screen anymore. It would be even better to have a fully encoded raw Wiki name in the box, like "[[Smith-12345|John Smith]]" which you could just click to copy to the clipboard, ready to paste into the Bio with Ctrl-V.
Chris, speaking for my system this slows down editing because the pop ups freeze up on my display. This means I have to move my cursor and refresh the page and then try again hoping that I miss the place where the pop up happened. Sometimes that is not possible because on my watchlist I need to be on the name to get to the profile. After I edit and try to go back to where I was the pop up is still there and I again have to refresh the page to do anything else from that point. This is time consuming and causes me to give up editing much sooner than I used to. I am running Windows 10 Home 64 bit on a HP Probook. I usually use either Firefox or Edge browsers. Due to other things I do Chrome is not an option for me because other sites I work on will not allow that browser, or any other. Yes, I certainly noticed the profile previews, but since I'd seen them before I decided you'd introduced them back at the beginning of your tests. I'm like most people here, I like the general functionally, but it does take up space. I'm wondering if you could have a way to shut it down/turn it on so people could decide what works best for them. I'd probably keep them on most all of the time, but maybe I'd find myself switching them off in some situations. I would switch them off if I could. This solution would be best. It would allow the feature for those who like it but still make things easier for those who do not like it. I would like an off switch, too. I see folks replying that the ʻcomplainersʻ can just click the black X. Well, sure, but clicking every time the window pops up when I am scrolling through a list seems redundant. Just make an off switch! Many thanks. For people who do one-name studies, the linked name is meaningless--EVERY name is the same. This saves time and is so valuable. I really appreciate this feature. I absolutely love this feature. It can save one so much time and effort, especially when creating profiles. Thank you! Wow Chris, this one is one of the best I have seen so far!! And there is a laundry list of improvements in the recent past! Thank you for this and I see it as a really GREAT addition to the tools in the box! I thought Profile Previews would not work on an iPad. However a strange sequence allows them to appear (but I don’t know why). If I click on a url for a profile in a G2G post then my Safari browser displays that profile. If I then click on the back key, then the G2G post is displayed with the Profile Preview. I wish there was some work around to get Profile Previews to work on a mobile device. I don't know anything about Apple products, but do you have any kind of gesture controls? I'm wondering if a simple gesture, like starting on a non-actionable point just to the right of the person URL then sliding left onto the URL could be made to work, act as an equivalent to a hover. It does seem like touch screens should have some way to fake a hover. I've been seeing profile previews on my Android smartphone. I've not yet worked out what I have done that makes them appear. This new feature is AMAZING! 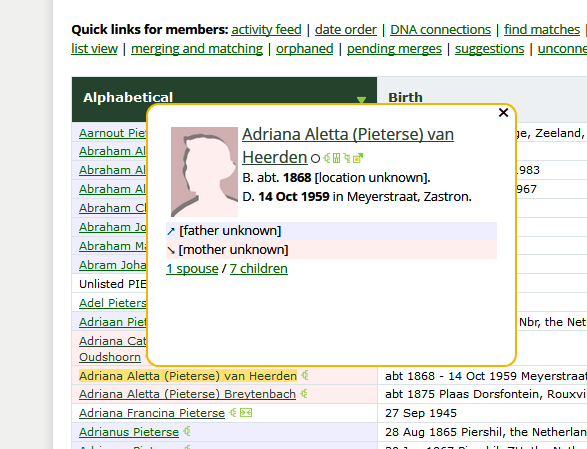 Have you seen your new Surname Navigation Page? Have you seen the 52 Ancestors and 52 Photos profile stickers for participants? Have you seen the full array of profile badges? New badge gallery. Have you seen our two newest Leaders? Have you seen the stats from our Clean-a-Thon? Have you seen this guide about ethnic admixture at GEDmatch? Have you seen the new Gallery of Members? Have you seen the new WikiTree tutorials?